Water gardening in containers is another way to enjoy your garden up close and personal. You can use a tub or other container on your patio, deck or balcony. They are a good way to try water gardening without building a larger, more permanent pond. It doesn’t cost nearly as much as is easier to maintain. When I bought the house where I currently live, it had a small pond with a spitter and a couple of live goldfish. It was an unending battle fighting algae in that little pond. It was in the direct sunlight and algae grew like crazy. I tried chemicals but nothing helped for long. At that time, I didn’t know algae just needs two things to grow – sunlight and a food course. Wouldn’t you know it – algae love fish waste! I had the perfect algae growing climate in that little pond. Eventually, I gave up and drained the pond and filled it in with gravel and soil. I have a fountain surrounded by containers of knockout roses and spirea in its place. I know now that I probably could have controlled the algae with water plants. Most container materials will work too – except for terracotta. It will absorb water and the structure of the pot will weaken. 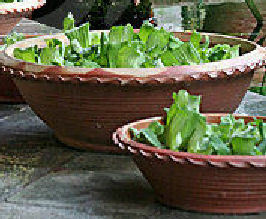 If using gardening pots, plastic or ceramic would be better choices. Water gardening in containers works great in a 15-25 gallon container, although if you plan to have just a few plants, you can use a big bowl. It depends on what type of plants you choose, and how much water they need to be “planted” in. Dark colored containers, or containers with a dark interior are best because they make the container appear deeper and discourage the growth of algae. Water gardening in containers requires six hours of sun per day for success. 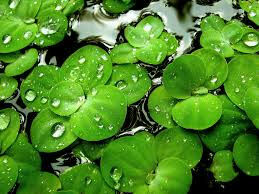 Most aquatic plants need full sun. Less than six hours will decrease blooming. 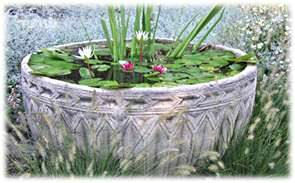 Water plants are grown in pots in heavy, clay garden soil. They are placed, pot and all, into the container for the water garden. Before you place your plants, add 1/2 inch or so of pea gravel to the bottom of the container to help keep soil in place in the water and to give a little weight to the container to keep it where you want it. Fill the tub with water and set your plants in place. Some plants will need to be placed at certain depths. You can raise plants if needed closer to the top of the water by setting them on something like bricks. 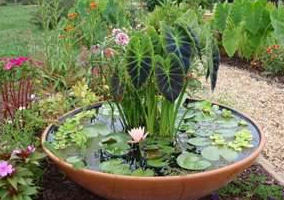 A nice water garden contains two to three potted plants and some floaters. You can follow the guidelines for container gardening design by choosing tall plants, trailing ones, etc. Most of us use water from municipal water supplies that is treated with chlorine. It’s a good idea to let the water in your container sit for about 48 hours before placing plants. This gives the chlorine a chance to evaporate. You can also buy chemicals to counteract the chlorine at stores that sell pond supplies. Remember this when you need to add water to the garden after evaporation. 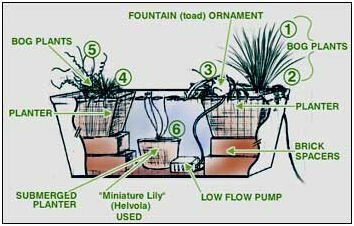 This diagram from the Denver Cooperative Extension Service at Colorado State University shows how you might set up a container water garden. You can add a small pump to the water garden, especially if you want to have a fountain effect with water sounds. It’s not necessary though. I had assumed that water gardening in containers would be a breeding area for mosquitoes. That’s not the case – the plants moving around keep the water from becoming stagnant. If mosquitoes do become a problem, try the small fountain, or skim the water to get rid of larvae. Plants in small water containers will need to be brought in for the winter. Lift the potted plants out of the water and store in water filled tubs somewhere cool and dark – a basement is good. Floaters can be kept indoors in aquariums with lights but it’s just easier to treat these as annuals and buy new ones each season. There are three types of aquatic plants that you can use when water gardening in containers. These are submerged plants, emergent plants, and floaters. They each add something pretty or practical to the water garden. But don’t overdo the plants. Water plants will multiply and grow, and you don’t want to completely cover the surface of the water. Try these submerged plants in your water garden – from left to right below: fanwort, anacharis and vallisneria. Emergent water plants for containers are also called marginals. emerge above the water. Irises and water lilies are marginal plants. won’t get much sun, try these plants. Here are some marginal plants to try in your container water gardens: from left to right below:arrowheads, blue flag iris, corkscrew rush, dwarf papyrus. Here are three favorites from left to right: Water hyacinth, water lettuce and water lilies. and path gardens is a great example.